The HRV Cup Champions are back and ready to defend their title. Join the Auckland Aces this season at Colin Maiden Park as they push for Champions League entry again. 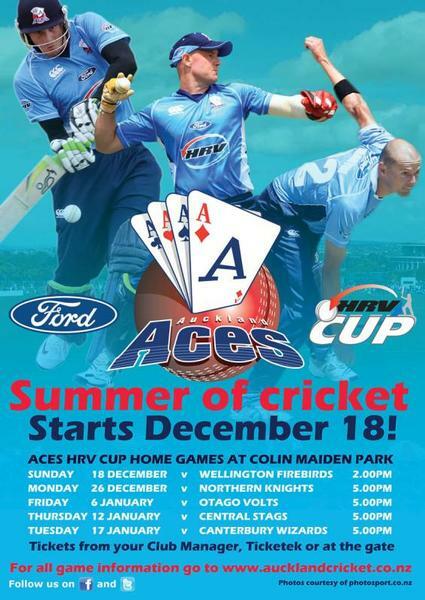 The Blackcaps are home for the summer, so come and support Auckland Aces local heroes Martin Guptill, Kyle Mills and Gareth Hopkins. There's plenty going on off the field as well with barbies, beers, kids zones, bouncy castle, entertainers, free giveaways, free parking - it's cricket and so much more. Grab some mates or bring the kids, sit on the grass, have a drink or a picnic in the afternoon sun and watch cricket’s finest slug it out for domestic supremacy. Free parking, and kids' entertainment zone at all games. Come to the game and support the Auckland Aces. Follow the progress of the Auckland Aces at the website.